The Best of Djavan airs daily on our streaming Station from 01-23-19 through 01-29-19 Monday-Friday at 7 am, 3 pm, 6 pm and midnight Central Time (US). Weekends, too. On The Radio: Listen to The Sounds of Brazil every Sunday, 2-4 pm on Chicago’s 90.9 FM WDCB and streaming live at wdcb.org. Click here for a complete list of our affiliate stations. We’re already counting down the days until February and that means that we’re already more than a third of our way through winter – and with Carnaval just a few quick weeks away, who can resist the urge to look past the rest of it? 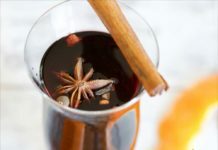 Bone-chilling cold in the days ahead begs for a seasonal Brazilian treat so try an easy recipe for Warmed Brazilian Spiced Cider, my original take on Brazil’s traditional Quintao, click the image below for how to do it, along with the story behind this one-of-a-kind sipper, plus a perfectly-paired song, too! Of course. R-E-L-A-X with The Sunday Brazilian Brunch. It’s perfect for smoothing out the bumps of a busy week. Three full hours every Sunday beginning at 5 am Central, and then again at 9 am, 2 pm and 8 pm. No app needed when you click the ‘play’ arrow at the bottom of every page at Connectbrazil.com. This Sunday, It’s fan favorites from Alexia Bomtempo and Celso Fonseca and you are invited to listen live! Our Streaming Station’s popular Brazil Back2Back segment has growen to a third play every Monday, Wednesday and Friday. Listen at 11 am, 2 pm and 5 pm Central. Always two of a kind, and always two in a row! Have an idea for an upcomiong Brazil Back2Back? Click here to make a request.